I really did want to play Assassin's Creed: Liberation. New Orleans! Creole accents! Bayous! A badass black lady protagonist! And yet... I never did. Finally, it looks like that's going to change. At Ubisoft's "Digital Day" event last week, I had a chance to check out a bunch of Ubisoft's upcoming download-only games. The first thing I saw as I walked in was a logo I'd been hoping to see for a little while: Assassin's Creed Liberation HD. Yep, in 2014, we'll be getting a reworked HD version of the game on 360, PS3 and PC. You likely remember that Liberation was the other big Assassin's Creed game released last fall, along with the console/PC game Assassin's Creed III. (You may also remember it from when the title of the HD version got leaked last week.) Liberation, however, was only released on the PlayStation Vita handheld, which made it impossible for a lot of Creed fans to play. In fact, I never even managed to play it, despite the fact that I own a Vita. Evan gave the game a positive review, remarking on the great soundtrack and terrific main character—Aveline, a black woman, rare not only for Assassin's Creed but for video games in general. (And certainly an interesting lens through which to view the game's late-18th century setting.) Our resident Assassin's Creed expert Stephen Totilo, meanwhile, was taken with the narrative setup. I played through some of the updated version last week and the easiest way to describe it is to say that it looks like a console Assassin's Creed game. That's no small feat, considering how much lower-res the game was on the Vita. The gameplay itself has been tweaked and improved based on playtesting and player feedback. The free-running paths have been tuned, and mission objectives and layouts have been updated to work better. This sounds like it will be a better, more definitive version of Liberation. The maps, however, will remain the same size. New Orleans and its environs aren't getting any bigger for the HD version. There will also be some new content: Three "chains" of five missions apiece, one chain tied to each of Aveline's three outfits. 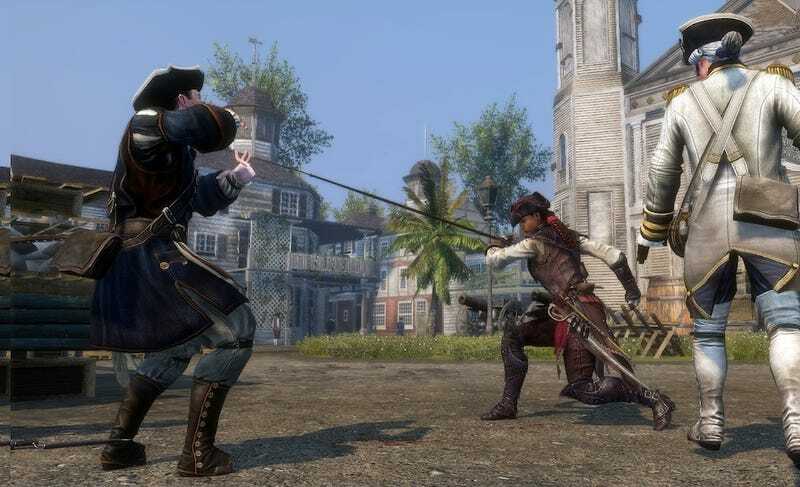 (Those were: A posh lady outfit, Assassin garb like Aveline's wearing in most promotional stills, and a slave outfit, each of which gave her a different set of restrictions and abilities). The Vita-only stuff has either been reworked or removed. The camera puzzles have been cut. The touch-screen stuff has been reworked or killed. Generally, though, there weren't too many features that Sofia couldn't make work with a normal controller. I played the PS3 version and this was all borne out—the game's New Orleans setting looked and felt much like Assassin's Creed III, but with a lady running and climbing. In other words, it seemed very much like a game I would like to play. Generally speaking, Liberation HD looks and feels good. It seems likely that it'll display some of the telltale signs of an upscaled game, but I'm guessing (or at least, hoping) that won't detract too much. Whether it'll actually stand toe-to-toe with the other main-entry Assassin's Creed games remains to be seen, but at the very least I'm looking forward to giving it a shot.